Cinco De Mayo at Pianos!!! 7pm SHARP! El Primero: It is CINCO DE MAYO. Los Dos: We are playing BY OURSELVES FROM 7-8 PM! FEATURING-- OUR LOOP PEDAL!!! 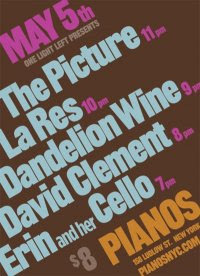 Los Tres: We will be accompanying the amazing, DAVID CLEMENT, at 8pm. ES INCREIBLE LA MUSICA THAT WE ARE GOING TO PLAY FOR YOU!!! Esperemos que vosotros vamos hacer la FIESTA con ERIN Y SU CELLO! for the bargain price of 8 DOLARES! help me rock my cello in a rock club.